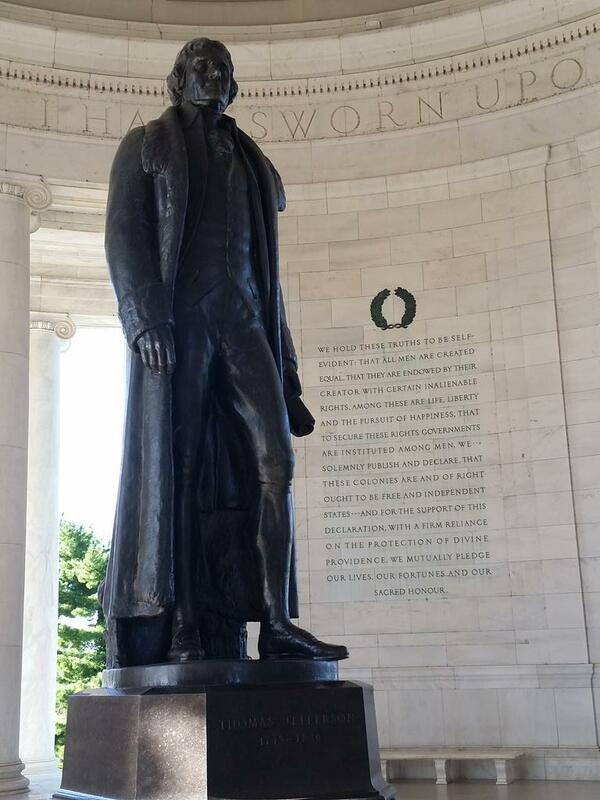 I went to DC over the weekend and visited the Jefferson Memorial. I had never visited the memorial before. I got up early on Saturday took a cup of coffee and sat for a bit with Jefferson. The memorial is very striking, all white marble with the large statue of Jefferson in the middle. The breeze coming off the tidal pool during the cool hours of morning made it a perfect place to think. There were benches around the edge of the room. I sat watching the tourists take pictures, parents explaining who Jefferson was to their children and people coming in just for a quick look. On the walls are great quotes from Jefferson. The quote that struck me the most was wrapped around the base of the ceiling. I was leaving when I saw that quote. The force of it made me sit back down. I started thinking about all the forms of tyranny that we have in our country. All the ways government, be it federal, state or local governments, force us to do or act a certain way out of fear of penalty. Jefferson would be enraged if he saw all the tyranny in the United States of America. He wouldn’t be alone. There are thousands of us that feel the same way. We all must work to undo the tyranny in our nation. It will be hard work. It will take years, but it must be done. The country that Jefferson built still exists, we must fight for it. AFP has their second Grassroots Leadership Academy Event this Tuesday August 25th! If you missed the first one no problem. This event is about how the Left with Anita Moncrief operates and you do not want to miss it. It’s going very interesting and educational. Brown County Tea Party would like to invite the public to their annual community picnic on Saturday, August 29th at 2:00 pm at the Mt. Orab Municipal Park located at 613 South High St. (Rte 68) Mt. Orab. State Representative Doug Green, State Senator Joe Uecker, a representative for Congressman Wenstrup, candidates running for sheriff, and many local officials will be there. You will have the opportunity to meet them and express any concerns you may have about their office or their position on issues. You may bring a covered dish if you desire but it is not necessary. We suggest you bring a lawn chair.